Will the milling and laser tools work on other metals besides aluminum? Yes, they will also machine brass and copper. STEPCRAFT machines are only designed for machining of non-ferrous metals. So you can not mill steel, stainless steel, etc. Also note that the laser will NOT cut metals. you can use it to engrave but it will NOT cut! Why are my circles are not perfectly round? How come my circles are not perfectly round? Then you are machining circles on a CNC and your circles are not coming out perfectly round, it is commonly caused because there is some backlash developing on the machine. Backlash is a tiny amount of play that appears over time and is noticed when a drive changes direction. When running in a positive direction, the gears/lead screw are engaged with the lead screw nut on the gantry, but when the stepper motor reverses direction there is a tiny space between the lead screw and the lead screw nut that has to be made up before there is positive engagement in that direction. After many, many hours of use or if your machine is not properly maintained and lubricated, then this backlash can develop. If this is happening to you, please download this document: Stepcraft UCCNC Backlash Compensation. This will show you how to setup backlash compensation in UCCNC so that you can “dial” out any backlash and go back to having perfect circles again. What is the total usable Z height on the D-Series CNC? The D-Series 420, 600 and 840 all have a max Z height of 140mm (5.51″). However this does not represent the maximum height of material you can process. From this height you need to subtract the spindle collet nut stick out as well as the length of the cutting tool you are using. NOTE: This is the case with just about every CNC machine on the market, not just STEPCRAFT CNC. 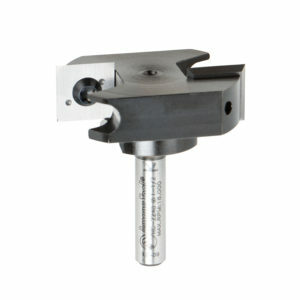 Most all CNC machines will have spindle and spindle nut/tool holder stick out that takes away from the usable Z height. So if you take into consideration the MM-1000 with dual spacers, you would have a total Z height of 140mm (5.51″) minus 26.34mm (1.04″) leaving you with a new max Z height of 113.66mm (4.47″). Now depending on what you intend to do, you can use this new value to plan your project. If you want to cut all the way through material, you would need to have a tool that is long enough, which you would further subtract from the new Z height value. 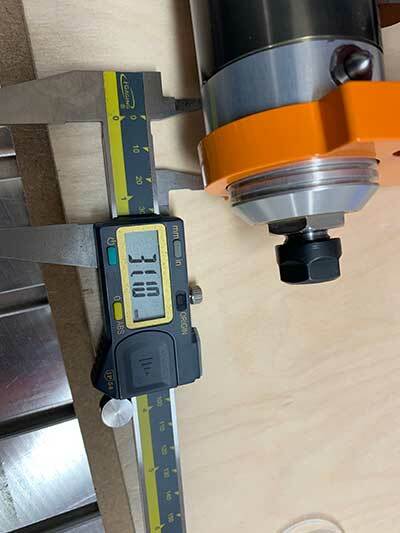 Example 1: New Z Value is 113.66mm (4.47″), if you divide that number in half, that would mean you can use a piece of material that is 56.83mm (2.23″) thick and the tool would have to stick out 56.83mm (2.23″) as well. 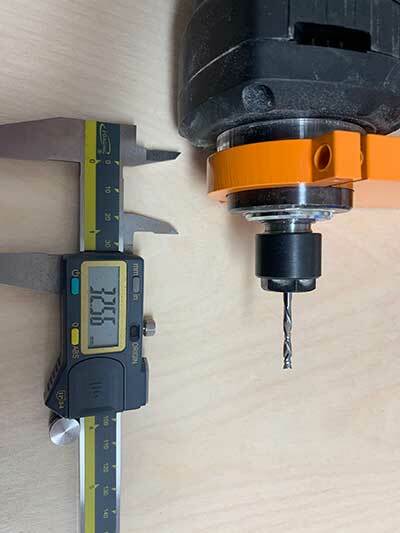 NOTE: This would also mean that the cutting height of the tool would have to be a min of 56.83mm (2.23″) or you run the risk of rubbing the shank of the tool on the material. Example 2: If you intend to only engrave on top of a piece of material, then your tool stick out can be much less. If you use an engraving blank that sticks out say 12mm from the bottom of the collet nut, then that means you can have a max material height of 101.66mm (4″). NOTE: please keep in mind you should also allow for a couple 2-3mm of Z height clearance for rapid, non-cutting moves on the CNC as well. So you would subtract another 2-3mm from the above numbers in a practical application. One way that you can increase your max material thickness that you can cut through is using double sided machining. Example: You can take your new Z value of 113.66mm (4.47″) and divide that into thirds. 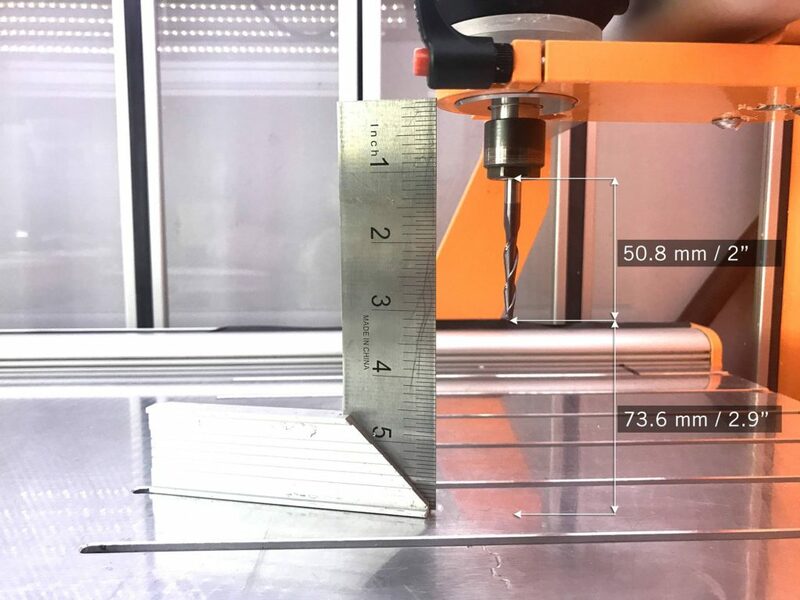 This would mean you can have a material thickness of 75.33mm (2.96″), or two-thirds and using a cutter with a length of 38mm (1.49″) you can cut one side of the project and then flip it over and cut the other side – so you are using a shorter cutter to cut through a thicker material by cutting each side. The HF-500 has a stick out from the bottom of the orange tool holder to the bottom of the collet nut of 31mm. The MM-1000 without spacer rings has a stick out from the bottom of the orange tool holder to the bottom of the collet nut of 38.6mm. The MM-1000 with a single spacer ring has a stick out from the bottom of the orange tool holder to the bottom of the collet nut of 32.56mm. The MM-1000 with dual spacer rings has a stick out from the bottom of the orange tool holder to the bottom of the collet nut of 26.34mm. What is the maximum thickness of aluminum I can cut through? This really depends on the bit you are using and what the flute length is. If you are using a bit with a 0.5″ flute length then your maximum thickness would be 0.5″. Keep in mind that when you go thicker than 0.125″ thick aluminum, you have to be very careful to take care of chip evacuation. 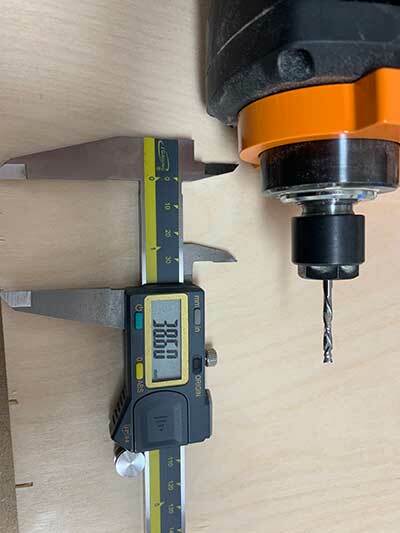 When your end mill starts to make a deep channel that is the width of the bit, then chips will fall in the channel and when the bit rotates, it can recut the chips causing excessive heat, chatter, welding of the chips to the tip of the bit or breaking the bit. A way around this for deeper cuts is to create a pocket around the perimeter that is wider than the bit so if chips fall in the channel they are not “forced” into the wall by the cutter. You should also use compressed air to continually blow the chips away from the bit and the channel. We have successfully cut through 1″ thick aluminum blocks without a problem. Keep in mind that this is a CNC router and not a CNC mill, so it is not designed to be as aggressive with your feeds, speeds and pass depths. Take care to not push the machine, spindle or end mill past its limits. What is a surfacing bit used for? A surfacing bit typically has a larger than normal cutting diameter (1 to 3 inches) and are used to flatten or level uneven surfaces on your project material. They are also used to take the thickness of a material down to a final required size. For example, you might have a piece of rough cut lumber that measures 1 inch in thickness but you need it to be 3/4 inch thick. If you don’t have a surface planer in your shop then you can use a surfacing bit with a pocket tool path to plane the material down. Another common use for surfacing bits is to clean up and level a spoil board. After continuous use your spoil board’s surface will have a lot of cuts in it and you might want to clean it up so it is perfectly smooth again. A surfacing bit is perfect for this, especially with machines where the spoil board is physically attached to the machine – you might want to prolong the use of it for as long as you can before replacing. Leveling your spoil board is also important. If you are looking to engrave .005″ into a piece of metal and your bed is off by a couple thousandths from one side to the other or front to back, then the thickness of your engraved lines will vary. By using a surfacing bit, you will ensure that your spoil board is perfectly level in relation to your gantry which will result in a uniform engraving. 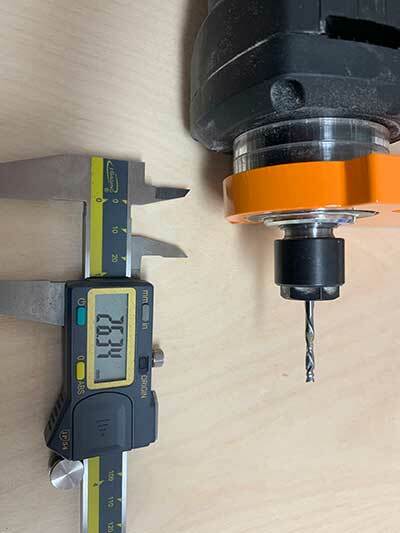 Note: Because of the larger diameter of a surfacing bit, it is important to note that you can not take as deep of passes or run as fast as you might with smaller end mills on most machines. Consult your machine’s manufacturer for assistance with proper speeds and feeds for surfacing bits. Do I need different spindles for cutting wood and cutting metals like aluminum? No, you do not need to use different spindles. The main factor will be how fast the feed rate will be that you run and how much material you remove per pass. If you with to run a light duty spindle like a Dremel 4000, you can run wood, plastics and metals just as well as if you were using a Kress 800W spindle. The only difference is that you will not be able to remove as much material and your feed rate will be slower the harder the material is. Keep in mind that dedicated CNC spindles will have better quality bearings which will offer less runout and therefore a longer life span and higher accuracy. 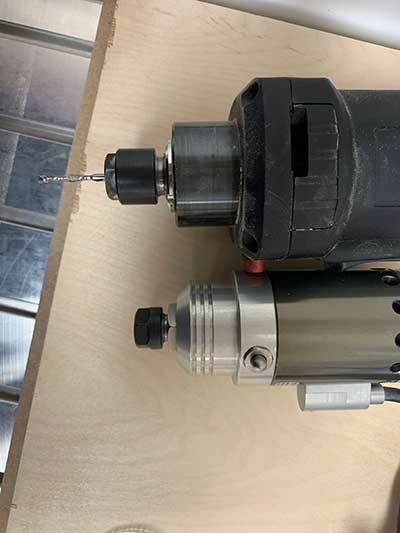 Using the Dremel example, this device is not meant for hours and hours of prolonged use, nor is it made to have lots of pressure side loading the main shaft. You will find that if you are not careful on the feed rate and pass depth that you will quickly wear out the bearings. A router like the Dewalt DW611 will also cut all types of material, but as with the Dremel, the bearings are not as good as with a dedicated spindle so you can expect more runout with a router. The STEPCRAFT HF500 is a purpose built spindle that was designed to work with all types of materials and has an excellent bearing system that provides very little runout and a much higher accuracy. The bottom line is that you can pretty much cut whatever you like with just about any spindle. You just need to be cautious on feed rates and pass depth. Can the STEPCRAFT CNC cut steel or stainless steel? No, the STEPCRAFT is only designed to cut non-ferrous metals like brass, aluminum and copper. You might be able to engrave steel with the right engraving bit and proper speed and feed settings, but you can not cut it. Can I use MDF as a spoil board when cutting aluminum? It is easy to find and relatively inexpensive. Make sure the Aluminum is clamped tight to the MDF/machine bed – if it is not you will get vibration, chatter, poor cut finish, and can possibly break your cutting bit. You can not use any lubricant when you use an MDF spoil board! It will swell and expand if it gets wet. So using spray or mist coolant or oils like Tap Magic is not recommended. An alternative spoil board that we use is acrylic. Acrylic is hard, flat, easier to machine than aluminum so it will not strain your machine and if you want/need to use lubricant, then you can without worrying about it damaging the spoil board. Can all end mills cut aluminum? No. While there are some “general purpose” end mills that will cut aluminum, some end mills are designed specifically for plastic, foam, wood or other non-metal materials. Where your CNC questions are answered!